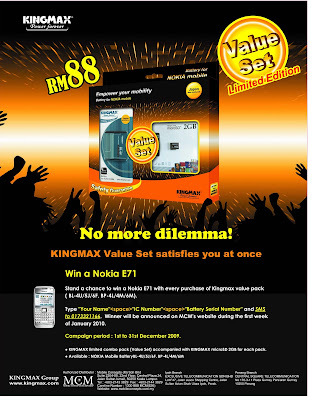 MCM is launching a new consumer campaign where you stand a chance to win a Nokia E71 business phone with every purchase of Kingmax Value Set in December 2009. The mechanic is simple. Refer to the attached advertisement visual. The winner's name will be announced on MCM's website by first week of January 2010.